LONDON, England (CNN) -- If Rob Spence achieves his goal, technology will change his view of the world -- literally. Eyeborg: Documentary filmmaker Rob Spence has created a working prototype of his camera-embedded eye. 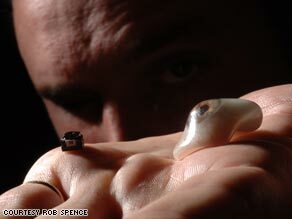 Spence, who lost an eye in a childhood accident, is in the process of installing a tiny camera into his prosthetic eye. He announced his plan last year, and now he's a step closer to fulfilling his aim. "It's been an expensive and laborious process to make this thing. But fortunately we have leveraged the right people and have a working prototype," he says. A documentary filmmaker based in Toronto, Spence wants to use the wireless camera in his eye to make films and examine where "recorded image and video intersect with humanity." Although, he says, the prototype containing delicate electronics isn't ready for frequent use yet. Spence, who calls himself the "eyeborg," is the latest example of the convergence of human and machine. No longer restricted to the realm of sci-fi novels and movies, technology is increasingly being integrated into the living body. Human kind has been using technology to improve the power of their senses since the days of cave men, according to James Geary, author of "The Body Electric: An Anatomy of the New Bionic Senses." He loosely describes bionics as any device that extends, repairs or enhances natural sensory abilities. For him, that includes everything from cochlear implants that provide deaf people with a sense of sound to the wireless gadgets people use today to talk on their mobile phones hands free. In recent years, technology has helped create smaller, more power efficient electronic devices. As a result, there has been a "big conceptual shift towards inserting these components inside, instead of outside the body," says Geary. Spence will not be augmenting his senses in the traditional bionic sense -- his vision won't improve at all because his retina was damaged to the point where he had his eye replaced with a prosthetic. But a California company, Second Sight, has developed a device that can restore limited vision for some blind people. So far, the company says it has implanted the device in 21 people around the world who have retinal degeneration. The device, which is still in clinical trials, consists of a camera mounted on a pair of glasses. Captured images are transmitted to electrodes implanted in the retina, which then send images to the brain. The device gives patients the ability to perceive patterns of light, which are then interpreted as images. Dr. Miguel Nicolelis is a neuroscientist at Duke University. He has spent the last decade investigating the links between brain activity and devices, an area of research known as brain machine interface. He hopes developments in the field will lead to the creation of the next generation of mind-controlled limbs. "We hope to restore mobility to those who have lost the ability to send messages to the brain and their muscles," he tells CNN. Scientists have already shown that monkeys with probes inserted in their brains are able to control artificial devices like robotic arms with their minds. They've found that computer software can interpret signals picked up by the electrodes. Brain machine interface ultimately could help restore mobility to quadriplegics and others, such as those suffering from spinal cord injuries, says Nicolelis. He's involved in a global project called Walk-Again that aims to develop a wearable exoskeleton that paralyzed users could control with signals from their brain. Finding a way to safely insert electrodes and probes into human brains remains an obstacle. But scientists are constantly working on finding ways to better integrate devices in living organisms. Seamlessly fusing engineered devices into living tissue can be challenging since devices usually are metal, hard and flat, according to David Martin, a professor of materials science and engineering at the University of Michigan. "This is where the real interesting scientific frontier is -- implanted devices integrating themselves in the brain, ear, eye and in muscle. The question is whether we can do that and not cause too much cell damage," he says. The technology being developed is cutting edge and pushing boundaries, but there are potential pitfalls. Since it's still early days, no one knows how bodies will react over the long term to inserted devices. Furthermore, people have a heightened awareness when it comes to their body, and privacy concerns are already being raised, according to Geary. "We're just really sensitive about anything we put in our bodies," he says. In science fiction, the cyborg is almost always the bad guy. The big barrier is overcoming that fear, he says.